With a Micro Market, meals are already pre-packaged and made for the customer. This cuts down dramatically on time needed to order and make food from a traditional cafeteria. Employees that have busy schedules appreciate a quick way to get a healthy meal before their next meeting! Cafeterias often have certain foods that they make on certain days, since making every meal every day can be wasteful and not efficient for food costs. When you have a micro market, you are able to have access to the same fresh meals daily without having to worry about the overhead cost and efficiency of making these meals.Along with the meal variety, Micro Markets offer a huge range of snacks and drinks that cafeterias do not have the ability to offer. Cafeterias often have very few sides to compliment your meal, maybe a few chip and cookie items. But with a micro market you have a slew of options to accompany your meal. Micro Markets often have chips, cookies, candy, protein bars, nuts and everything in between! With a Micro Market, a much lesser start up cost is needed to serve your employees. Companies that offer Micro Markets usually cover the cost of the install. This dramatically decreases the amount of money that a company would need to invest to create a kitchen, hire a staff, and purchase food. To build more on the previous point, no additional staff is need to support a Micro Market. Not even a person working a checkout! With self checkout kiosks, no additional employees are necessary. By not hiring employees, a company can save a lot of money! With the pre-packaged food means that there is no additional lines to be waiting in when trying to get some food or a drink, making the most of employee’s lunches and breaks. Who likes to spend their time waiting in line only to have to go back to their work station to finish eating? Along with needing no employees to run a cafeteria, the space is also not needed. 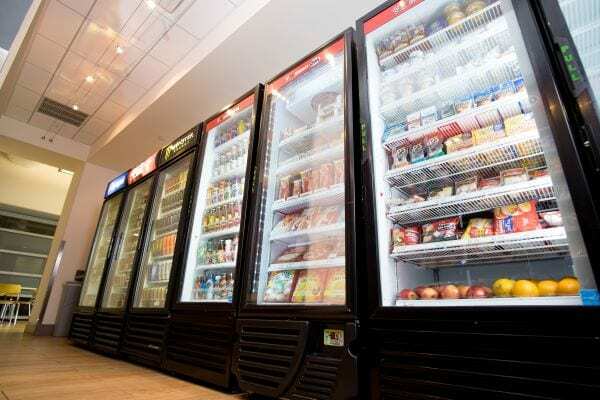 Some space is required to place all the refrigerators, coolers, shelving, and self checkout kiosk, but it is much smaller than the space needed to run a cafeteria. If you are in the Phoenix area and want to revamp your break room services, learn more about PROformance Vend USA Micro Markets!